Yellowstone Bluffs B&B is an intimate bed and breakfast in the historic western town of Miles City, Montana. 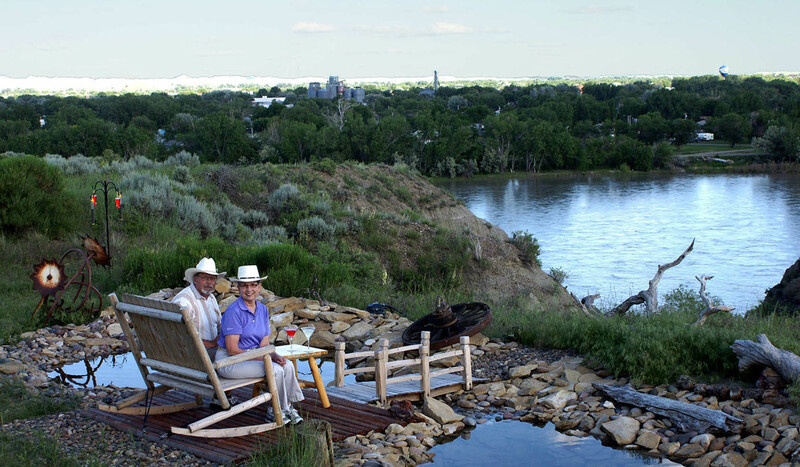 It sits on sandstone bluffs overlooking the Yellowstone River and the expanse of the city beyond. We offer western hospitality, prairie style and exceptional comfort. Each guest room has a private bath. Two rooms have king beds and one has a queen bed. All rooms face the river and city and have sunny sitting alcoves to enjoy the view. All rooms have flat screen TV's and wireless internet access. Our breakfasts are homemade and made to order and can be served in room or in our dining area. We use local and regional products when possible. Directions - Coming from Billings (west to east) From Interstate 94 take first Miles City exit (135) north. Take Business District I94 (Main Street) to the center of town to the first stop light (7th street also hwy 59). Turn left (north) on 7th street (hwy 59) and proceed across the Yellowstone River. Take first left after crossing the bridge which is Prima Vista Dr. Take second left on Prima Vista which is Buena Vista (paved drive). Drive to the end of the road to Yellowstone Bluffs B&B. Directions - Coming from Glendive (east to west) From Interstate 94 take second Miles City exit (138) north. Take Business District I94 Haynes Ave north to Main Street. Turn left on Main Street to the center of town to the stop light on 7th street (also hwy 59). Turn right (north) on 7th street (hwy 59) and proceed across the Yellowstone River. Take first left after crossing the bridge which is Prima Vista Dr. Take second left on Prima Vista which is Buena Vista (paved drive). Drive to the end of the road to Yellowstone Bluffs B&B. Directions - Coming from Broadus (south to north) Stay on hwy 59 coming into town (which becomes Haynes Ave). Take Haynes Ave north to Main Street. Turn left on Main Street to the center of town to the stop light at 7th street (also hwy 59). Turn right (north) on 7th street (hwy 59) and proceed across the Yellowstone River. Take first left after crossing the bridge which is Prima Vista Dr. Take second left on Prima Vista which is Buena Vista (paved drive). Drive to the end of the road to Yellowstone Bluffs B&B. Directions - Coming from Jordan (north to south) You are on hwy 59 coming south. Turn right on Prima Vista which is the road BEFORE you cross the river. Take second left on Prima Vista which is Buena Vista (paved drive). Drive to the end of the road to Yellowstone Bluffs B&B.Directions - Coming from Billings (west to east) From Interstate 94 take first Miles City exit (135) north. Take Business District I94 (Main Street) to the center of town to the first stop light (7th street also hwy 59). Turn left (north) on 7th street (hwy 59) and proceed across the Yellowstone River. Take first left after crossing the bridge which is Prima Vista Dr. Take second left on Prima Vista which is Buena Vista (paved drive). Drive to the end of the road to Yellowstone Bluffs B&B.